This morning I wrote a song, a very simple song for children to sing. 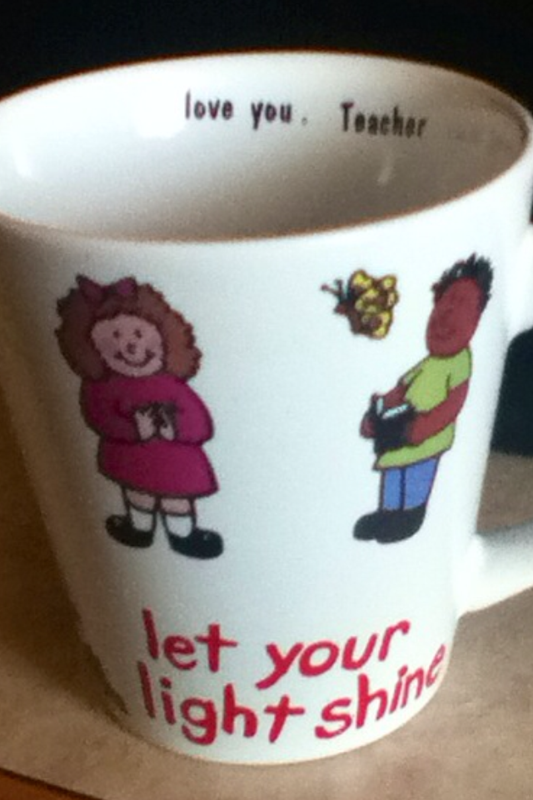 It started as I sang to myself while I was making breakfast, pouring a drink into a “Let Your Light Shine” mug. At my laptop, the song grew into a poem, “Choice #1” below. When I tried to SING what it had grown in to, I was disappointed. It didn’t sing very well. I enjoyed the subtle references to familiar scripture, and the arc of the poem. But it didn’t SING well. fa-mi re fa ti la so! So, I just started singing, imagining singing with three-year-olds in Sunday School. That turned in to the second song below. Now, I’m in a pickle. Do I save the first one for my upcoming Joyful Read-Aloud, Read-Along Rhymes: Songs of Love and Faith? Or do I admit I ruined it by trying to expand on it. Should I go with the simple song? I decided I would ask your advice. Oh, let my light so shine! With a little light like mine. Oh, let my love so grow! Because that’s how they’ll know. Oh, let my song ring out! And join my happy shout. With a little life like mine. With a little love like mine. With a little help like mine. With a little song like mine. Readers, which choice do you recommend? And why? I’m eager for your help. This entry was posted in The Writing Process, Writing about Religion in Children's Books and tagged Let Your Light Shine, poem for kids, religious poem for kids, songwriting. Bookmark the permalink. 8 Responses to Readers, Help Me Decide. Is Simpler Better? I love that you are writing music for children. I wish you had a recording of your song here. There are widgets that let you post your music. Have you considered that? Thank you, Tina. I am experimenting right now with how to record and post music. I appreciate your encouragement! Wanted to drop in and tell you how much I appreciate your loyal reading and commenting. It is friends like you that make it all worthwhile. Thank you, Gail. You have a VERY worthwhile blog! Forgot to add – I prefer #2. Thanks! That’s the one I’ve decided to go with, by the way.